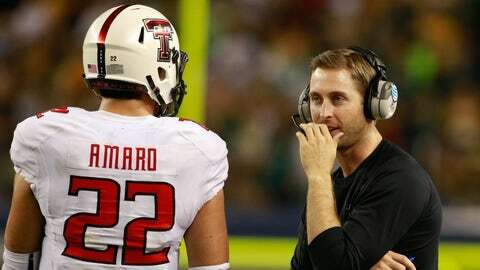 Texas Tech head coach Kliff Kingsbury talks with tight end Jace Amaro, who piled up 98 receptions for 1,240 yards in the Red Raiders' Air Raid offense. The college football world got to know Texas Tech early in the 2013 when first-year coach Kliff Kingsbury’s Red Raiders jumped out to a 7-0 start and top 10 ranking. They were poised to be one of the nation’s best stories, an upstart team led by an alum and a walk-on freshman quarterback. Then reality hit. The Red Raiders lost their final five games, including three to teams ranked in the top 20, falling out of the top 25 and fading into the background of the college football landscape. And to top it off, starting quarterback Baker Mayfield announced Wednesday that he is transferring. Thanks to a few late Big 12 upsets, however, Texas Tech received a bowl bump, moving up a spot to the Holiday Bowl, where the Red Raiders will take on No. 14 Arizona State. Texas Tech has now reached a bowl in 20 of the last 21 seasons. The Sun Devils, 10-3 this season after losing to Stanford in the Pac-12 title game, have faced the Red Raiders just once, and that game was 13 seasons ago, so here’s a primer on Texas Tech before the teams square off Dec. 30 in San Diego. Offensive standouts: TE Jace Amaro, Jr. (98 receptions, 1,240 yards, 7 TD); QB Baker Mayfield, Fr. (2,315 yards, 12 TD, 9 INT, 64.1 completion percentage); QB Davis Webb, Fr. (2,315 yards, 16 TD, 9 INT, 61.9 completion percentage); WR Eric Ward, Sr. (80 receptions, 904 yards, 8 TD); RB Kenny Williams, Jr. (117 carries, 480 yards, 8 TD); OL La’Raven Clark, So. Texas Tech has played ASU just once. The Red Raiders traveled to Tempe to open the 1999 season, with the Sun Devils earning a 31-13 win. Kingsbury was the backup quarterback for Texas Tech at the time and went 2 of 5 passing for 15 yards in the game. Texas Tech was coached at the time by Spike Dykes, the winningest coach in school history and father of current Cal head coach Sonny Dykes. Dykes retired after the season, his 13th at the school, and was succeeded by now-Washington State coach Mike Leach. Kingsbury played two seasons under Leach and has installed Leach’s "Air Raid" offense at Texas Tech. Like this year’s Holiday Bowl, the 1999 game between the teams was played on a Monday night. At 34, Kingsbury is the youngest head coach in a major conference and second-youngest in college football behind Toledo’s Matt Campbell (by about two months). Kingsbury has risen rapidly through the coaching ranks since playing his last professional season with the Winnipeg Blue Bombers of the Canadian Football League. Kingsbury began his coaching career as a quality control graduate assistant at Houston under Kevin Sumlin in 2008 and 2009. He was promoted to co-offensive coordinator and quarterbacks coach for the 2010 and 2011 seasons before following Sumlin to Texas A&M, where he also coached the offense and quarterbacks, including Heisman Trophy winner Johnny Manziel. Of Kingsbury’s nine assistant coaches, five are Texas Tech alums. They are: co-defensive coordinator Mike Smith, co-offensive coordinator Sonny Cumbie, co-offensive coordinator Eric Morris, safeties coach Trey Haverty and cornerbacks coach Kevin Curtis. Three of those coaches played for Texas Tech in the 2004 Holiday Bowl, which Texas Tech won 45-31 over Cal. Cumbie won game MVP honors as the Red Raiders’ quarterback, going 40 for 60 passing for a career-high 520 yards and three touchdowns. Haverty, a wide receiver, had eight receptions for 147 yards, and Smith, a linebacker, had four tackles. — The Red Raiders had 12 players receive All-Big 12 honors as voted by conference head coaches. First team: TE Jace Amaro. Second team: OL Le’Raven Clark, DL Kerry Hyder. Honorable mention; PK Ryan Bustin, P Ryan Erxleben, WR Jakeem Grant, WR Bradley Marquez, QB Baker Mayfield, S Tre’ Porter, LB Pete Robertson, LB Will Smith, WR Eric Ward. — Coaches voted Mayfield the Big 12 Offensive Freshman of the Year. Two quarterbacks led Texas Tech’s passing attack, which ranks second in the nation at 392.0 yards per game. After expected starter Michael Brewer, a sophomore, was sidelined by a back injury, Mayfield — a walk-on true freshman — won the job. Mayfield excelled early on but left with an injury during Texas Tech’s win over Kansas on Oct. 5. Fellow freshman Davis Webb took over and wound up starting the next five games before being replaced in the second half of a loss to Kansas State on Nov. 9. Mayfield started the season’s final two games. Following media reports Wednesday that Mayfield intended to transfer, Texas Tech confirmed Thursday that he is leaving the program immediately and will not play in the Holiday Bowl. Mayfield reportedly said he had miscommunications with the staff. Amaro was one of two unanimous selections on the coaches’ All-Big 12 first team (Oklahoma offensive lineman Gabe Ikard was the other) and a semifinalist for the John Mackey Award for the nation’s top tight end. Amaro leads the nation in receiving yards among tight ends by a good margin. The closest tight end to Amaro’s 1,240 yards is North Carolina’s Eric Ebron with 895. Mackey winner Austin Seferian-Jenkins had 413 yards and seven touchdowns. Only five teams in the FBS have thrown more combined interceptions than Texas Tech this season, as Mayfield and Webb threw nine each. While high interception totals are not uncommon in the pass-happy "Air Raid" offense, they could spell trouble against ASU. The Sun Devils’ total of 21 interceptions ranks third in the nation, and cornerback Robert Nelson is tied for fourth in the nation with six picks. Five of ASU’s 21 interceptions have been returned for touchdowns. A big factor in Texas Tech’s demise over its final five games of the season: run defense. The quality of competition increased significantly over that stretch — the Red Raiders faced three top-25 teams plus Texas — and their run defense couldn’t withstand it. After allowing an average of 123.4 rushing yards per game during the team’s 7-0 start, the defense allowed 294.0 rushing yards per game during the 0-5 finish. ASU, which should have star running back Marion Grice (leg) healthy for the game, is averaging 184.0 rushing yards per game.